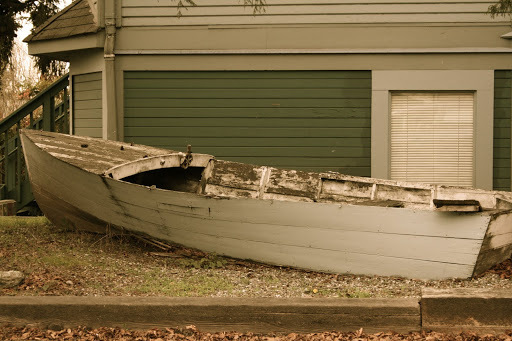 Leaving an old boat in your yard...that's lazy. The merriest of summers to you all. Perhaps you have noticed that over the past month I have barely written on here. To be honest its because I have been a bit lazy. Summer is a break, a laid back breather to help us gather our wits for the coming fall. I suppose I understand this concept. Its a fine line between resting & laziness. Resting comes from the motive of storing up. Allowing your mind, body & soul to come to a healthy place so that you can continue on in a healthy way. It is a mindset that allows peace, joy and strength to build within you. Laziness is being passive. It is an unwillingness to follow through and do what needs to be done. Rest prepares you to complete the task. Laziness is avoiding the task. Putting it off without the discipline to actually do it later. When I rest, I don't sit idle. I do things that put life and energy back into my soul. I read, spend time with Jesus, chat with a friend about the condition of my heart. I sit and dream with God about what is to come. I engage in creative outlets that remind me that there is a certain 'lovely' quality to life. When I rest, my body is storing up for the battles ahead. I sit under a shady tree and sharpen my kingdom weapons. I build up my storehouses with joy knowing that the land is going to be mine one day. Laziness, that's another story. I get irritated. The slight weight of things I should have done builds up. I toss things aside deciding that I need time to just idle, be neutral. Veg and 'rest'. I trick myself that it is resting, but it is really depleting. I fill my time with empty nothings and don't prepare myself for anything. Which is exactly what I get at the end - nothing. This irritability sets in my heart. I am prone to grumpiness, my temper is shorter with my kids. I wake up expecting little from my day and it bothers me. Instead of snapping out of it, I fall deeper into it. The more I put off, the more I put off. If I have one basket of clothes to fold, it will be doubled by the following day. I simply stop doing things. Lazy. Inner frustration builds and I don't want to think about any big, exciting God dream. I'm not ready for one. I haven't fed myself a diet of truth and discipline. I haven't engaged in joy, simply sit-com laughs. Rest vs. Laziness. In Matthew 25 there is a story of 10 virgins. The bridegroom is coming and they all had their lanterns with them. Only 5 of them could be bothered to get oil ahead of time. The other 5 put it off. All ten fell asleep. Half of them with their oil by their side. When the bridegroom came only the 5 who were prepared went with him. Those five weren't hectic overstressed girls. They rested & slept just like the other five. BUT - They had a sense of occasion. They knew that at any moment something glorious and significant could happen. They were prepared. The other five had no sense of occasion. They were lazy and had no expectation on their evening. They just put off getting oil and went to bed. Just like any other night. But it wasn't any other night. They missed the moment. It's easy for us to get into a routine. Just another day at work. Just another date with my spouse. Just another family night. Just another church service. Just another Monday... Laziness with no sense of significance. Restful people don't try and muster up some significant moment all the time. But, they are prepared for one. Then when it comes, they can enjoy it and marvel at the occasion. It's the way we are called to live. What if tomorrow is the day that God wants to speak a new direction to you, but you can't be bothered to stop checking Facebook when you should be reading the Bible and praying. Or maybe there is another level of intimacy for you and your spouse, but you just don't want to find the emotional energy to ask them deep questions. Or perhaps there was a financial miracle God wanted to do in your life, but you hate organizing your finances. So you simply let them stay messy & you don't notice the hand of God at work. Every day is memorable if you do something memorable. Rest this summer. Rest hard. Laugh deeply in order to refill your weary soul. Do what needs to be done so that you can hold the things coming. Significance is all around. Today is an occasion. Don't miss it.